Yesterday’s explosion of public interest in pronunciation was triggered by a press release from the British Library announcing a new project to “track the changing sounds of modern English pronunciation”. The BBC arts correspondent, David Sillito, had made a short introductory video. I agreed. An hour or two later BBC Radio Five Live rang to say would I do a quick interview with them first. I agreed to that too, though it meant getting out of bed half an hour earlier. They would send a car for me at 06:30. I duly arrived at the Television Centre in Wood Lane, White City, which is where BBC radio is temporarily housed during the refurbishment of Broadcasting House. I did the R5 interview, and was waiting in the green room for R4 when an emissary from the World Service waylaid me to get me to do an interview with them too. OK. I don’t generally give out my mobile phone number, but I did supply it to the BBC in case of emergencies. They must have circulated it within the organization, because by now there were text messages asking me to do interviews for BBC local radio in (a) Belfast and (b) Wales. Nothing came of the first, but the second turned into a 45-minute phone-in. I think I was the only phonetician in Britain who wasn't on one or other radio or TV channel this morning—in fact, I was asked to be, but had an Exam Board to chair. I was to have been the linguistics talking head on C4 news tonight, but Lancaster U's studio has broken down! All good stuff though. 'Impact'. …which is true, and is what justifies all the hassle these things put us through. It heightens people’s awareness of phonetics, and helps (I hope) dispel some of the prejudice and ignorance surrounding popular views on pronunciation. The BBC is notoriously mean over payment to contributors, while also being strangely lavish in the use of chauffeured cars. I explained to them that for me to get from my home to the Television Centre it was quicker to use the Underground than to struggle by car through the traffic on London’s roads, but they insisted. By Underground it takes me sixty minutes door-to-door, including the fifteen minutes’ walk to my local station. The chauffeured car took up to an hour and twenty-five minutes and for the four journeys must have cost the BBC something like thirty times the price of a one-day travelcard. I would rather have travelled on public transport and augmented my meagre fee by the sum they paid the taxi company. It would have been better for the environment, too. Ah well. In English adjectives ending in the suffix -ant or -ent we still see the ghost of the Latin stress rule. By this I mean that the word stress in such adjectives depends on how the stem to which the suffix is attached ends. (Obviously, we are dealing here with words of three or more syllables, i.e. with stems of two or more syllables.) If the stem ends in what Chomsky and Halle (The Sound Pattern of English) call a ‘weak cluster’, then the stress goes on the preceding syllable. If it ends in a ‘strong cluster’, then the stress goes on that syllable itself. A weak cluster consists of a short vowel followed by a maximum of one consonant. A strong cluster, on the other hand, has either a long vowel, or 2+ following consonants, or both. So a weak cluster reflects a Latin single-mora (‘light’) syllable, while a strong cluster reflects a Latin multi-mora (‘heavy’) syllable. The stress rule in Latin itself is: stress the penultimate if it is heavy (impeˈrātōr; conˈfectus, asˈcendō), otherwise stress the antepenultimate (conˈfĭcĭō, ˈrăpĭdus). Classicists call this the ‘Penultimate Law’ (W. Sidney Allen, Vox Latina, CUP 1965, p. 83). —with penultimate stress reflecting the Latin long vowel in pōnō and the consonant clusters in the other words. In acquiescent and abhorrent the spellings sc, rr reflect what were consonant clusters in Latin, even though we now pronounce single consonants in English. In apparent the Latin vowel of appārĕō was long, even though we now pronounce it in BrE as short æ rather than as long eə. Conversely in provident Latin -vĭd- was short, generating antepenultimate stress, although we have a long vowel aɪ in provide. It wouldn’t be English if we didn’t have a number of exceptions and irregularities. The vowel of Latin plăcĕō was short, yet we say complacent kəmˈpleɪsənt as if it were long. By rights excellent ought to be penultimate-stressed (Latin excellens with a double consonant), as should protestant. But they aren’t. All this is by way of a lead-in to an unusual pronunciation I heard the other day: prevalent pronounced not as the usual ˈprevələnt but as priˈveɪlənt. Latin vălĕō had a short vowel, which is why most of us use antepenultimate stress not only in prevalent but also in equivalent and ambivalent. I can see two factors which might lead someone to give this word penultimate stress, -ˈveɪl -. One is the verb to prevail, obviously related in morphology and (to some extent) in meaning. The other is chemical terminology, which has now spread to disciplines such as linguistics. In chemistry, valency ˈveɪlənsi (BrE) or valence ˈveɪləns (AmE) is a measure of the combining power of atoms of a given element. Chemists pronounce words such as trivalent, pentavalent and multivalent with penultimate stress, -ˈveɪlənt. In LPD I do recognize the possibility of ˌæmbɪˈveɪlənt. But not yet of priˈveɪlənt, prə-. Ought I to? I won't be posting a blog entry tomorrow (Thur. ), because I'll be busy in the BBC studios for brief interviews on BBC Radio 5 (around 07:35) and Radio 4 (around 08:10). It's to do with a new pronunciation initiative at the British Library. The spelling-to-pronunciation rules for Italian are reasonably straightforward once you have learnt them. Apart from the e–ɛ and o–ɔ contrasts, which some Italians ignore anyway, the only important thing the spelling doesn’t tell you is where the word stress goes. The default is for it to fall on the penultimate syllable (‘parole piane’: caro ˈkaːɾo, fanciullo fanˈtʃullo, dottore dotˈtoːɾe, incominciare iŋkominˈtʃaːɾe). But in a minority of words it falls elsewhere. Final stress is always shown by a written accent mark (‘parole tronche’: città tʃitˈta, caffè kafˈfɛ). The big trap for the foreigner is words with antepenultimate stress (‘parole sdrucciole’: povero ˈpɔːveɾo, scatola ˈskaːtola, vicolo ˈviːkolo). It is very easy to be caught out ordering “feˈɡaːto” from the menu in an Italian restaurant, instead of the correct ˈfeːɡato (fegato, ‘liver’). You may remember the earthquake at L’Aquila (blog, 13 April 2009) and the difficulty we had getting that name correctly stressed. So I had some sympathy when a friend of mine recently came back from a weekend break in Florence. He was enthusing about the art and architecture he had seen and about the influence of the … meˈdɪtʃi family there. But no, in Italian the (de’) Medici have antepenultimate stress, ˈmɛːditʃi. Actually I am in no position to crow, because I see from my Dizionario italiano multimediale e multilingue d’Ortografia e di Pronunzia (blog, 19 July) that the stressed vowel in Medici is open-mid rather than the close-mid that I wrongly put in LPD as the Italian pronunciation. This name does though raise a point of principle. My friend is by no means alone in giving this word penultimate stress. On the contrary, even though we may agree that the correct anglicization is ˈmedɪtʃi, nevertheless meˈdiːtʃi and the like are very commonly heard from English speakers. Was I right to include them as secondary variants in LPD? 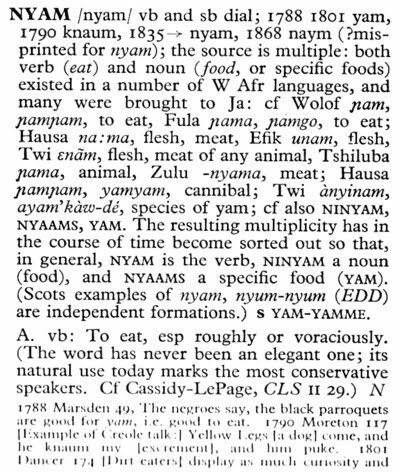 Or ought a pronunciation dictionary to shun such incorrect forms? It’s the old question of description vs prescription. While I prefer to go for accurate description, at least I try to prioritize the correct form. As we all know, there are cases like Beijing in which the ‘incorrect’ -ˈʒɪŋ is much more prevalent in English than the -ˈdʒɪŋ that corresponds to the pronunciation in the original Chinese. Confession: OK, the man whose funeral I went to (yesterday’s blog) was black and of West Indian (namely Montserratian) origin. Like most Montserrat families since the volcano disaster of 1997, his descendants are scattered among the Montserratian diaspora around the world, but particularly in the UK and the US. So some at least of the grandchildren and great-grandchildren on whose names I commented may be American and following the naming fashions of African-Americans rather than of English people. Believe me, though, that the register of children at any London primary school will indeed contain a fair number of names that are missing from LPD and other pronunciation dictionaries. Even from the white working class (think of names like Kayleigh). One of my social duties from time to time is to create funeral service sheets for Montserratians who have died in London. Most are buried rather than cremated, and that means that whereas the funeral service is held in church near the deceased’s residence the actual burial takes place in one of the cemeteries located several miles away. So the service sheet has to tell you where this will be. Rather than ‘burial’, people prefer to use the posh word interment. The trouble is that many Montserratians think it is spelt ‘internment’ and pronounced correspondingly. In the service sheets I make myself I spell the word correctly, of course. But others don’t. Here’s what Wednesday’s service sheet said. And finally... as an EFL mistake I have even heard interment pronounced as ˈɪntəmənt. It does look confusingly like words with the prefix inter-. Today I’m concerned not with geographical names, commercial names, or characters in fiction and mythology, but just with names of people; and among them not with surnames but with personal names (christian names, forenames, first names). Naturally I tried to do my best to give these good coverage in LPD. But I’m conscious of a fair number of gaps: in particular, Indian names and Islamic names. Plenty of native speakers in Britain bear these names, and neither LPD nor any other pronunciation dictionary covers them adequately. But it’s not just Indian and Islamic names. Parents today feel very few constraints on the choice of names for their children. They are free not only to create new spellings for familiar names, but also to invent entirely new names. How then is a pronunciation dictionary to keep up? It can’t. This was brought home to me yesterday when I attended a funeral for a man of the same age as myself. The service sheet listed the names of all his immediate family. He was called Dan, and among his brothers and sisters (he came from a big family) were John, Helen, Edith, Joyce, Olivia and Ethel. No problem there. His sons and daughters included George, Dawn and Lorna, but also the unusually spelt Dannii. Then come the grandchildren. The names of one or two are unremarkable (Marcus, Karen, Shawn), but they are in a minority. Most of them have names not to be found in pronunciation dictionaries: Vonetta, Chiedza, Khaila, Shelayne, Keanna. Then his four great-grandchildren are named Stephon, Sha’Myri, Tierra and Teondray. I suppose the first may just be an unusual spelling of Stephen, but the others have every appearance of having been invented on the spot. Not all parents choose to do their own thing in this way. 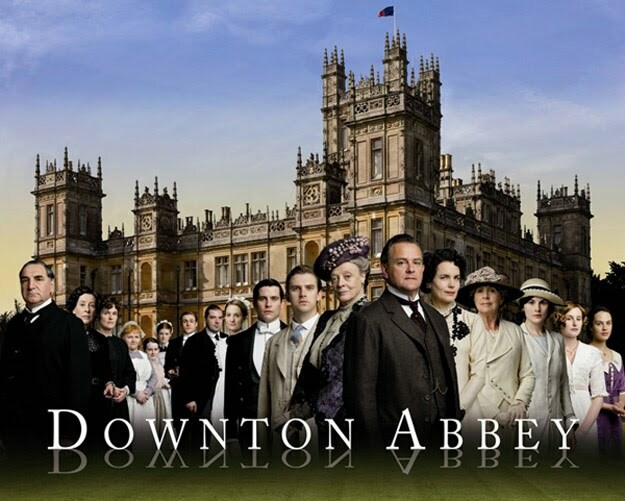 Like everything else in Britain, it tends to be sensitive to social class differences. I have no grandchildren, but my great-nephews are called Jack, Joseph, and Joe, and my great-nieces are Sophie and Lucy. Traditionally we regard the use of the weak form of Saint in names as more or less categorical in BrE. Obviously it is much less usual in AmE. But in BrE this seems to be changing: I keep hearing Brits using the strong form. I’ve heard Seɪnt Albans, Seɪnt-Leonards-on-Sea, Seɪnt George’s Hospital, though never yet as far as I am aware Seɪnt Helens (in Lancashire). Perhaps there is something special about Lancashire: I don’t think I’ve heard Lytham St Annes with strong seɪnt, either. Personally, I weaken saint not only in all the names just cited but also in the names of all those West Indian islands, too, though I know the locals don’t: St Martin, St Thomas, St Barts, St Kitts, St Croix, St Lucia, St Vincent. 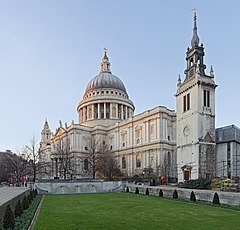 And you’ll know about the idiosyncrasies of the surnames St Clair/Sinclair ˈsɪŋkleə, St John ˈsɪndʒən, and St Leger ˈselɪndʒə, as well as of Gilbert & Sullivan’s reference to the London street St Mary Axe ˌsɪməriˈæks in the song about someone with a name very similar to my own. Exceptionally, contrastive intonation can sometimes lead us to accent a syllable that has no lexical (underlying) stress. It ˈwasn’t exactly \/green, | but it ˈwas green\ish. Indeed, this particular suffix sometimes gets treated as if it were an independent word. There are other suffixes that firmly resist contrastive stressing. Logically, in this second example, you might expect B to accent the n’t part of didn’t. Indeed, it is possible to switch to the unweakened form of not and say I did not, placing the accent on not. This seems to happen regularly in Irish English, but in English English I think we generally prefer just to stick with didn’t, keeping the accent (illogically) on the did part. What, then, do we do if we read aloud the following, which I came across in Richard Dawkins’ The Greatest Show on Earth? I retain the author’s italicization. Even though it is not easy for human chemists to predict what change in protein shape will result from a particular genetic mutation, it is still a fact that once a mutation has occurred, the resulting change of protein shape will be in principle predictable. Would you say that last word as pridɪktˈəbl̩? Or what? It’s not “corn” beef, it’s corned beef. Perhaps kɔːnˈdə? No, I think you just have to slow down and articulate kɔːnd extremely clearly. Being the son of an anglican priest, I have always been familiar with the word sojourn, the biblical term for making an overnight or temporary stay in a place. Since it’s a word I’ve always known, I’ve never hesitated about its pronunciation, which for me is ˈsɒdʒən (automatically implying ˈsɒdʒn̩ as an alternative). Daniel Jones, while recognizing ˈsɒdʒən as a possibility, nevertheless preferred ˈsɒdʒɜːn, with a strong vowel in the second syllable. He also allows ˈsʌdʒ- for the first syllable. Meanwhile AmE tends to prefer soʊˈdʒɝːn, ˈsoʊdʒɝːn, sometimes with a stress difference between noun and verb. 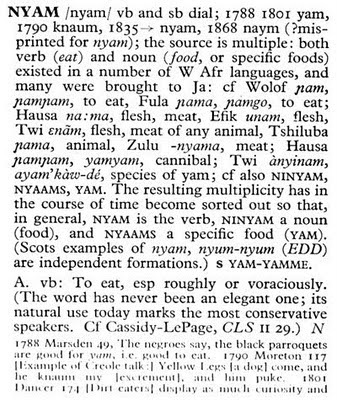 For many people this is no doubt a word which — if they know it at all — they know only or mainly in its written form, so it is not surprising that the pronunciation is nowadays rather uncertain. I wonder if anyone has r in the first syllable. Probably not. According to the OED, until the sixteenth century it was sometimes spelt with r. This may reflect the second of the two possible Latin sources, subdiurnāre and superdiurnāre. Thanks to Flloyd Kennedy for drawing attention to this Australian cabaret turn, in which Andrew Hansen pokes fun at the way Julia Gillard, the Australian PM, pronounces the word negotiate. Where most people say nɪˈɡəʊʃieɪt, Ms Gillard says nɪˈɡəʊsieɪt (or with Australian vowels more precisely nəˈɡʌʊsiʌɪt). In LPD I give both possibilities, prioritizing ʃ. EPD, ODP and the OED do the same. The Oxford Concise gives only ʃ. I think we would probably all agree that the s form has overtones of exaggerated formality, perhaps prissiness. In some cases I suspect it may also be a spelling pronunciation. For the other words mentioned by Andrew Hansen, in LPD I prioritize ʃ in every case, giving the s variant for appreciate and substantiate, but not for propitiate, initiate or differentiate. Everyone has ʃ in ocean, never s; but in oceanic some do have s. Most people have ʃ in the middle of species ˈspiːʃiːz, but in speciation -si- is perhaps commoner than -ʃi-. So stress has something to do with it. (And by the way why does pronunciation have -si- rather than -ʃi-?). I’m not sure that I can unravel all the historic and synchronic factors involved here. 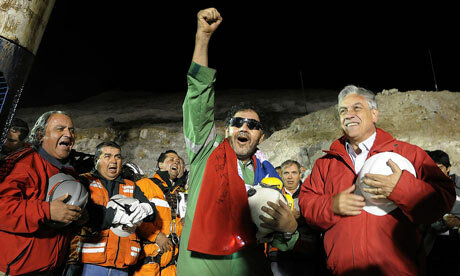 The eyes of the world have been on the dramatic and inspiring mine rescue in Chile. It has been very gratifying to see the BBC deploying Spanish-speaking reporters able to interview the miners and rescuers in Spanish while translating the questions and answers into English as they do so. Let’s hope that this not only does something to rescue us from our reputation of being unable to speak foreign languages but also demonstrates to today’s young people the value of learning languages. Not all reporters and not all TV channels managed to get the names right. The name of the second man out was Sepúlveda, Spanish seˈpulβeða, properly anglicized as sɪˈpʊlvɪdə; but I kept hearing him referred to as ˌsepl̩ˈveɪdə. The name Acuña, Spanish aˈkuɲa, got its tilde ignored as it became English əˈkuːnə, and Esteban, Spanish esˈteβan, ehˈteβan, was misstressed as ˈestəbæn. There is also an issue with the name of the country. The traditional English pronunciation of Chile is ˈtʃɪli, homophonous with chilly and chil(l)i (pepper). That was the only pronunciation known to Daniel Jones for BrE and to Kenyon and Knott (1944) for AmE. But in Spanish it’s ˈtʃile, and in recent years the revised anglicization ˈtʃɪleɪ has come increasingly into use, at least in AmE. That was how President Obama pronounced it in his message of support. And what about the corresponding adjective? Traditionally Chilean has always been ˈtʃɪliən. But now some people have started saying tʃɪˈleɪən. I’m not sure why this should be: no other words in -ean are treated in that way (think of Shakespearean and c(a)esarean on the one hand, European on the other hand, and variable Caribbean on both). Spanish chileño offers no support. Our choirmaster makes us warm up in the usual way by performing various singing exercises. One thing we have to do is to get ourselves to concentrate properly on what we are doing (“move into the zone”), for which we have to sing tongue twisters. In one of them, we repeat the words red lorry, yellow lorry at speed up the scale, then orange lorry, yellow lorry back down the scale. It’s remarkably difficult to get it right. If native speakers find it tricky, think of what the Japanese would make of it. You can sympathize with the Americans, who call it a ‘truck’ rather than a ‘lorry’. I wonder why the 80s rock band Red Lorry Yellow Lorry chose a tongue twister as their name. I know it’s a sign of old age to complain about the ignorance of the young, but there you are. Today’s complaint concerns a bouncy new ITV newsreader presenting the local news for the London area, who doesn’t know how to pronounce Godalming, a town of 21,000 people about 50 km (30 miles) from London. No, it’s not “ɡɒˈdælmɪŋ”, it’s ˈɡɒdl̩mɪŋ. How can you be a Londoner, a professional newsreader, and not know that? Must be one of those people who never venture south of the river. As I lay in bed this morning, listening half-asleep to the parliamentary report on the radio with a discussion of the coming cuts in welfare payments, I was jerked awake by the realization that the expressions child benefit and housing benefit have different stress patterns. The reporter talked about possible reductions in child BENefit, and then later about the question of HOUSing benefit. I realized that these stressings agree with my own intuitions on how to stress these particular compounds. And there’s no logic in it. It’s very important when discussing the stressing of compounds to disregard two well-known effects that can cause the default (lexical) pattern to be overridden: (i) contrastive stress and (ii) stress shift. They get not only HOUSing benefit but also CHILD benefit. She works in local government for the HOUSing department. Her job involves the determination of housing BENefits. —both of which go against the default pattern. There are going to be severe CHILD benefit reDUCtions. Having got those two disturbing factors out of the way, I am left with the conclusion that as dictionary entries I would give ˌchild ˈbenefit but ˈhousing ˌbenefit. I have no idea how widely these patterns would be agreed to by other speakers of BrE, and I wonder what non-Brits unfamiliar with these expressions would say. The stressing of compound nouns is a notorious difficulty for EFL. Although the basic rule is clear (the main stress goes on the first element of a compound), there are not only several well-established classes of exceptions (e.g. if the first element names a place, time, material, or ingredient), but there is also a long tail of cases where all one can say is that there is no firmly established pattern. We can coin new compounds on the fly (or indeed recoin compounds of whose existence we are unaware), and it may be impossible to determine whether or not there is some implicit contrast involved or what you would say in a contrast-free context. Meanwhile we have some well-known sets of illogicalities. I’ve sent her a BIRTHday card. She bought me a BIRTHday present. Here’s some birthday chamPAGNE for you! 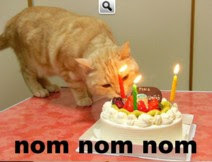 I’ve written him a birthday TRIBute. Could you please tell me whether I should say FAmily MEMber or FAmily member. In other words, is this compound single- or double-stressed? I don't think there's any fixed pattern. On the whole I’d go for “family MEMber”. One of the songs our choir is practising for our Christmas show is I wonder as I wander, which is a “traditional Appalachian carol” or, according to another account, was “written in 1933 by John Jacob Niles from a fragment of a song he heard sung during an evangelical church fundraising meeting”. I notice that our singers find it quite difficult to pronounce the two verbs accurately. They sometimes seem to sing aɪ ˈwɒndər æz aɪ ˈwɒndə. I even caught myself doing it when not concentrating properly. Here’s a fragment of our tenor 2 rehearsal track that we use for practice: see what I mean. 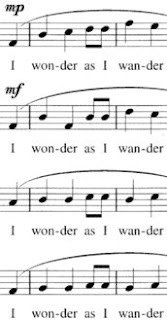 Presumably we all agree that I wonder (how Jesus the Saviour did come for to die) should have the STRUT vowel, thus ˈwʌndə (or perhaps the Appalachian equivalent ˈwəndɚ); while I wander (under the sky) should have the LOT vowel, ˈwɒndə (or ˈwɑndɚ). Or are there people who pronounce the two words as homophones? Some subset of the English people who have ɒ in one and among? Or do some people neutralize the two vowels in the context of a preceding w? Failing that, I think the difficulty may be due to the difficulty of parsing and understanding the phrase I wonder as I wander out of context and of identifying the appropriate word from the spelling in each case. Wonder is one of those words in which the STRUT vowel is spelt o instead of the more usual u (compare under, thunder, asunder, which rhyme with it), while wander is one of those words in which the LOT vowel is spelt a instead of o (compare ponder, yonder). Thanks to everyone who commented on yesterday’s posting. I don’t apologize for trying to devise “rules” for selecting an appropriate intonation pattern. They are exactly what typical NNS postgraduate students of phonetics need when faced with the task of marking up intonation on a written dialogue. Furthermore, without rules of the kind I offer they tend to suggest some very implausible patterns. NS students, on the other hand, know intuitively what will do and what won’t, but they can’t explain why. If I pair a NS and a NNS in class, we have the blind leading the blind — until they have some rules. a language is best learned in an intuitive way with free exploration, personal experimentation, encouragement of careful listening, contemplation, etc. —but faced with a group of Japanese postgraduates who have been learning English for over ten years (often without, let’s be honest, enormous success) you need to offer them something more tangible. So when somebody suggests to have a drink, one says "There's a thought" with emphasis on the deictic to convey that this immediate suggestion is exceptional (compared to all other thoughts by anyone at any time). Likewise "That's a good dog" implies that a particular dog is more than just good; he's exceptionally so in comparison to the average dog. —my reaction is that this is no doubt reasonable, but it doesn’t help. My students will immediately ask WHY the speaker would want to convey that the suggestion is exceptional (because it isn’t, really), and WHY the speaker feels it necessary to say that his dog is “more than just good”. Fine if you do the same thing in your L1; not helpful if you don’t. Let’s go on with yesterday’s problem of how to supply the NNS learner with rules to generate an acceptable intonation pattern. Back to the dog. Consider the matter logically. Your utterance contains two apparently new lexical items, clever and dog. It also contains a demonstrative, and demonstratives behave like lexical items in that they are by default accented — as mentioned in §3.11 of my book. So in this exclamation there are three likely accents, there’s, clever, dog. We know that the nucleus goes by default on the last of them, which is dog. However, both you and the dog know that he is a dog. (We have to assume that the dog knows — or perhaps we just have to approach things anthropomorphically.) So you can argue that dog is given, not new. That leaves clever as the last accentable word. But that is not what we say. Strangely, we deaccent clever, even though it might appear to be the most important word. Idiomatically (? ), we place the nucleus instead on the demonstrative. You’re a \clever little dog, | \aren’t you? You could construct some kind of post-hoc justification for placing the nucleus on there’s. The dog training we are engaged in has the purpose of making the dog clever. Therefore both dog and clever are given by context. Therefore the nucleus has to go somewhere else, and there’s is the only other possibility. \This is a clever dog! But be honest: would you have come up with this pattern just by following the rules? No, you need your NS intuition, or to be a speaker of an L1 that does the same thing, or at least to be familiar with what is idiomatic in English. That was ˈone ˈclever \dog! A: Let’s have another drink. B: Now there’s a thought! You want to decide on an appropriate intonation pattern for what B says. You apply the rules: locate the nucleus on the last new lexical item, unless there is a reason such as contrastive focus for it to go somewhere else. B: Now there’s a \thought. Cases such as this, where the typical NS pattern doesn’t result from the intonation rules we teach NNS learners, are in my analysis intonational idioms. I am always interested in collecting instances of such idioms. In my book (English Intonation, CUP 2006, page 172, or in the Japanese translation page 256) I give a number of examples similar to this one, with a nucleus idiomatically placed on a demonstrative (that or there). You can say \that again! It explains nothing simply to claim that the speaker chooses to emphasize the demonstrative, treating the deixis as especially important (or some such wording). My ideal is to supply EFL learners with an algorithm that enables them to predict with confidence an appropriate spoken intonation pattern for any written fragment of dialogue. Where I fail in this ambition, I may need to refine my rules. Failing that, I call the pattern idiomatic. As I brush the egg off my face, I agree I’d better stick more strictly to phonetics. Today’s blog will be derivative. First, here’s a cutting-edge report from the world of phonotectonics and consonantal drift. 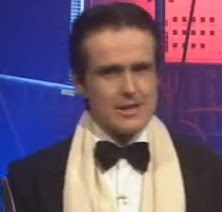 Second, we have a video of a young Londoner doing rather impressive impressions of twenty different accents. This video went viral over the weekend, so you may have seen it already. I thought that was pretty good on the whole, though the attempt at a Japanese accent is feeble. And he needs a scriptwriter. You may consider his “natural” speech, his own accent, rather interesting, too. Despite his extensive use of intervocalic t-glottalling and th-fronting, he does not think of it as Cockney. On the contrary, the very first “impression” he attempts is one of Cockney. It differs from his usual speech by, for example, incorporating shifted diphthongs and by a marked change of voice quality. 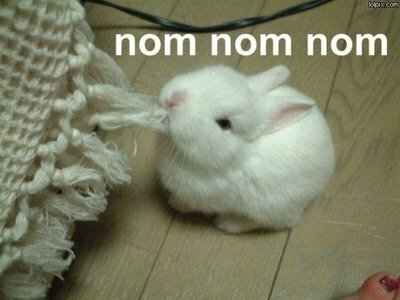 Thirdly, a footnote to Friday’s nom nom nom.